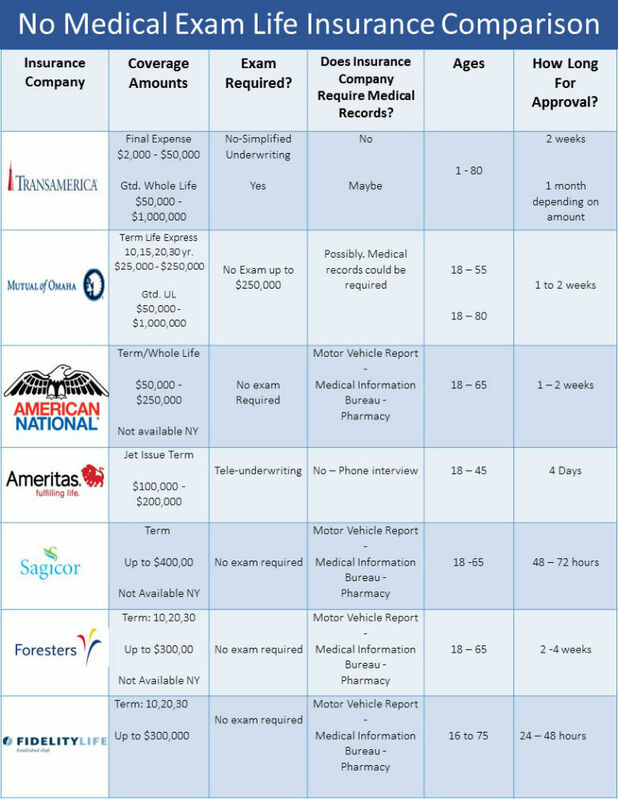 Why are more and more people opting for no medical exam term life insurance than traditional life insurance? There are several reasons. Life insurance with no medical exam does not require a medical exam. It’s as simple as that. You still have to submit an application and go through accelerated underwriting. There is no need for a nurse or paramedic to come to your home or office. There are no needles, no blood work and no poking through your private medical records. Getting life insurance without a medical exam basically requires that you answer medical questions and some lifestyle questions and depending on your answers, a policy could be issued in a matter of a few hours. With a traditional life insurance policy, you will need to fill out a lengthy application and schedule a medical exam to apply for a policy. The insurance company will then require that a nurse or paramedic comes out to your home and complete an abbreviated medical exam. The nurse will check blood pressure, your height and weight, stick you with a needle, draw your blood and then ask you to pee in a cup to provide a urine sample. Your exam and application are submitted to the insurance company who hands your file over to an insurance underwriter. The underwriter reviews your lab work and then contacts your doctor to obtain your medical files. This whole process could take 6 to 8 weeks. What a hassle! Why Should You Consider Life Insurance without a Medical Exam? What is the Downside Of Life Insurance Without An Exam? Coverage Amount: The biggest downside of this type of policy is that you are limited with the amount of coverage you can buy – typically between $50,000 to $500,000. (Some companies now offer up to $1 Million of coverage). Because you are not submitting to an exam and providing your medical records, an insurance company is only willing to take on a certain amount of risk. Cost: Skipping the exam for a life insurance policy will cost you more. You can expect to pay anywhere from 20% to 30% more than a traditional policy. Qualifying: When it comes to qualifying for coverage, no exam insurance companies are a bit fussier with how you answer their medical questions. If you have some health issues or if you like to sky dive for instance, it will be harder to get approved for coverage. We get a lot of questions about applying for life insurance with no exam, basically because the concept is so new, many people are surprised to find out that this type of policy is actually available. Q. What type of no exam insurance policies are available? No medical exam life insurance has been growing in popularity over the past few years but is still relatively new to many people. There are currently only a handful of companies that offer these types of policies. But as consumer demand grows for a more simplified and faster issued policy, more companies will probably enter the field. Simplified Issue Term Life Insurance: 10,15, and 20 year term insurance plans are available with guaranteed level rates. Level Death Benefit Whole Life Insurance: A policy that will last your lifetime and you cannot outlive. Simplified Issue Universal Life: Similar to whole life but less costly with flexible premiums. Graded Benefit Whole Life: This policy is specifically for people with health issues such as diabetes, heart disease or history of cancer who have trouble qualifying for a policy. The death benefit is limited in the first two years to the premium amount paid plus interest. Q. How long does it take to approve my policy? A. Depending on the company we are applying for, it is possible to get your policy approved within 48 hours. Some companies can take up a few days but we will advise you which company is best for you based on your needs. Q. If there is no exam, why do I have to answer health questions? A. Even though you don’t have to take an exam, you still have to answer a series of health questions. No insurance company will issue a policy without at least knowing you are not going to die tomorrow. The life insurance company also checks your health history with the Medical Information Bureau (MIB) which if you ever applied for insurance or went to a doctor, emergency room, clinic and etc., contains a file on your health history. They will also look into your Motor Vehicle Records (MVR) to make sure you are not a hazard to yourself by reckless driving or driving under the influence of alcohol or drugs. Q. Can I get life insurance if I have health issues? A. You may be surprised to find out, Yes! No exam policies are not only for people who are healthy. If you have conditions such as, diabetes, high blood pressure, high cholesterol or heart disease, you can still be approved for no exam coverage as long as these conditions are under control. However, expect to pay more for a policy. Q. How can I get a quote for a no exam policy? We are here to help. Since there are only a few companies who offer this type of policy and it is somewhat specialized, call our office at: 914-633-1717 to speak with one of our agents to find out if you will qualify for a life insurance policy with no medical exam.